Published in the Dover Express, 19 September, 1980. The older seaward defences of the Western Heights were St Martin’s and St Stephen’s Batteries, overlooking the harbour, which were armed with muzzle-loading guns. On a lower level was Archcliffe Fort, that used to be armed with six muzzle-loading guns. For many years before its demolition this fort had no guns. Further west, on the edge of the cliff, was the South Lines Battery, used for practice, having the Army Service Corps quarters and the headquarters of what used to be the Kent Artillery Militia in their rear. The Militia disappeared with- the introduction of the Territorials and the building was subsequently used by the Royal Engineers. In the early 1900s Dover's defences consisted of three great works facing the sea, erected for the purpose of protecting the Admiralty Harbour and its approaches. The strongest of these, the Langdon Battery, nearly a mile eastward of the Castle, was built in 1900. It was then armed with three 9.2 breech-loading guns, its arc of fire commanding the Straits of Dover, having an effective range of 15,000 yards. (The ancient fable about "Queen Elizabeth's Pocket Pistol" is that it would carry a ball to Calais Green. Even these great guns would not do that). Built at the same time two new batteries were placed on the Western Heights. The largest was sited on the top of the ridge beyond the western extremity of the Citadel. It was armed with three 9in breech-loading guns having a long sea range: and the central battery was built on the slope facing the Admiralty Pier, armed with three 6in breech-loading guns. Castle Street became the new route from the Market Square to the Castle following agitation which began in 1829 and led to the demolition of property which barred the way to the construction of a more direct link between Castle Hill Road, built in 1787 as a military road, and the market place. The public men who were mainly associated with promoting the construction of Castle Street were Mr William Prescott. Mr Edward Knocker, Mr John Finnis and Mr Henry Elve. Their individual efforts were mainly concerned in the opening of the part of the thoroughfare above Stembrook, the lower part being dependent on the Paving Commissioners, who were unable to take any steps to acquire the property necessary to open the Market Square end until they obtained the Improvement Act of 1836. The site of Castle Street, prior to 1829, was in a condition akin to the low-lying land on the north side of the river, in the tanyard, of a marshy nature, in places some 8ft. lower than the present level of the street. Across the swampy ground flowed the Dour, as it does now, but the old thoroughfare of Stembrook crossed the river without a bridge, and there was a sharp rise of the road out of the ford into the bye-way beside Messrs Leney's and later Hawksfields offices, leading across to Dolphin Lane. This was before the formation of any part of the street had been undertaken, and, at that period, the land between Stembrook and the foot of Castle Hill was mainly held by Mr Humphrey Humphreys (the owner of the adjoining tanyard), Mr Jeken (the owner of Castle Hill House and grounds), and the Dover Almshouse trustees. Mr Humphreys' meadows were bounded by a small stream, which parted from the Dour below the Dieu Stone footbridge, crossing into the site of Castle Street, just above Mr Terson’s residence, then turning west, following the boundary of the Almshouse land south of Castle Street, and by a rather irregular course again joining the river Dour near where the Granada (now the ABC) Cinema was built in 1929, on the yard of the old Phoenix Brewery. It was the land on the tanyardside of this which was low and marshy, that on the southeastern side being nearly at its present level. The land across this site, which was required to form Castle Street, was purchased in 1829 by Mr John Finnis. Mr Henry Elve and Mr William Prescott. A little later Mr Edward Knocker made large purchases of property in the upper part of the area, including Castle Hill House, which was. up to that time. Mr Jeken's residence, and previously had been Mr Stringer's. Mr Stringer’s name was written large on the property at the foot oi Castle Hill in the early days of the 19th century. His residence was Castle Hill House and his grounds extended over the whole of Claremont Place, and the land at the rear. Where the road crossed from Castle Street to St James' Street was a well known landmark called Mr Stringer's barn; on the land between Eastbrook Place and Ashen Tree Lane was Mr Stringer’s stable and gardener’s cottage; stretching away from the front of Castle Hill House was Mr Stringer’s shrubbery, including the triangular piece still left there; and the land now called Victoria Park was Mr Stringer's field. This was long before the making of Castle Street; but much of the property which Mr Edward Knocker bought with-Castle Hill House was within the Castle Street improvement zone, and he was entitled, with the other gentlemen named, to be regarded as one of the creators of the new thoroughfare. It needed no Act of Parliament to make the upper part of Castle Street. The owners of the land combined their energies, so that, between the years 1830 and 1835, the street down to Stembrook was formed, and also its offshoot, Russell Street. 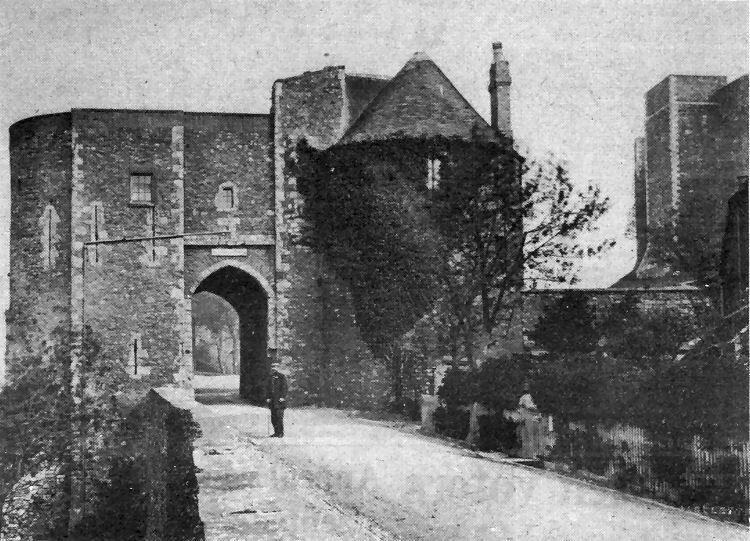 Another century-old photograph taken at the castle by Dover photographer Martin Jacolette, of Peverell’s Tower, one of the old entrances to the inner defences. Also known from time to time as Beauchamp or Marshal’s Tower, it was named after the builder and first commander of it, William de Peverell. Hugh de Beauchamp was a later commander of the tower and a marshal of the castle. Beyond the arch for many years was a saluting base with a row of cannon. Armament of a more modern variety, but still ancient by 20th century standards, is shown below in an engraving which appeared in the Illustrated London News, of April 10, 1869. It depicts Aveling traction engines being used by the Volunteer Artillery to haul big guns up what is presumably intended to represent Castle Hill or the hillside up which Waterworks Hill runs.